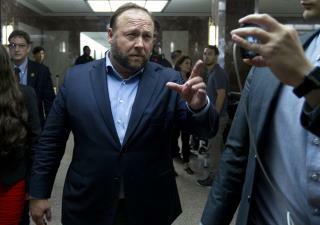 (Newser) – The biggest stars of Wednesday's Senate Intelligence Committee hearing seem to be an empty chair and Alex Jones of InfoWars. The former was reserved for Google's leadership, which unlike Twitter and Facebook was a no-show. The latter got into it with Sen. Marco Rubio outside the hearing, which Fast Company notes is open to the public; Politico reports Jones sat in the first row just behind Sheryl Sandberg and Jack Dorsey. During a hearing recess, Daily Beast reporter Will Sommer tweeted that Jones went into the hallway outside the room and got into a "heated exchange" with Rubio. Jones was acting like the dickhead he is. Funny, but not nearly as funny as Laura Loomer shouting at Jack Dorsey to reinstate her twitter verification. Uh, has anyone ever seen Alex Jones and Russell Crowe in the same room?